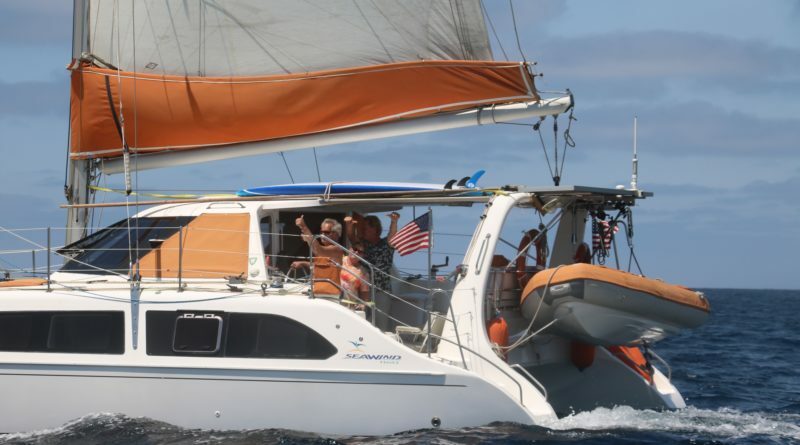 The 12th annual Catalina Multihull Rally Roundup returns to Two Harbors, Aug. 17-20. CATALINA ISLAND ― Four days of fun in the sun and on the water are scheduled at the Isthmus in August, as the 12th annual Catalina Multihull Rally Roundup comes to the island’s West End, Aug. 17-20. The four-day event begins at 5 p.m. on Aug. 17, with a dinghy roundup at Two Harbors. Participants bring drinks and appetizers to share as people hop from catamaran to catamaran to socialize with everyone. Morning talk with a choice of bloody marys or mimosas and a continental breakfast, followed by a skippers meeting, is scheduled for the morning of Aug. 18 at the Isthmus Yacht Club. The rest of the afternoon is leisure time to float, cruise or raft-up. A hoedown at the new and revitalized Two Harbors with catered barbeque food followed by line dancing starts at 6 p.m. The race from the West End to Cat Harbor takes off at noon, Aug. 19. Upon arrival at Cat Harbor, skippers can sit back and relax in another raft-up. A sail along the backside of the island to Avalon will ensue the following morning (Aug. 20). The cost per person is $125 and does not include mooring fees. Online registration and more information are available at bit.ly/2eOQErP. The rally first started in August 2006 as the Seawind West Coast Rally but has “grown to include any kind of multihull,” Kim Dumas of West Coast Multihulls stated. West Coast Multihulls, dealer of catamarans and trimarans, hosts this event. Denison Yacht Sales, Hayden Insurance and Inflatable Boat Specialists are current sponsors.